App Store reviews play a very important role in a customer’s decision to download an app. As such, it is very common for the developers to write “reviews” for themselves. I was prompted to write this article when @mugunthkumar mentioned “the reviews looked like insider job”. 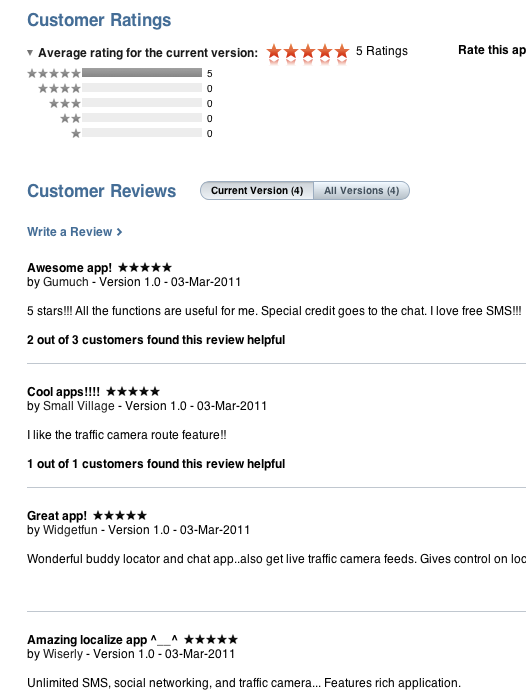 I took a look and is very sure it is fake reviews, generated by Singtel Idea Factory. With those pointers in mind, you know not to trust the review when you encounter one. And not waste that $1.99. All 5 stars, reviewed on same day (with no further reviews), lots of ! !, title styles with “app”. Reviewer only reviewed 1 app. Reviewed gave M1’s My Movies (competitor to Singtel) a 1 star app (when the app averages 3.5 stars). Disclaimer: As a developer myself, I admit I have written my own “reviews”, but mildly, and smartly. ← Awesome memo from Nokia’s new CEO!